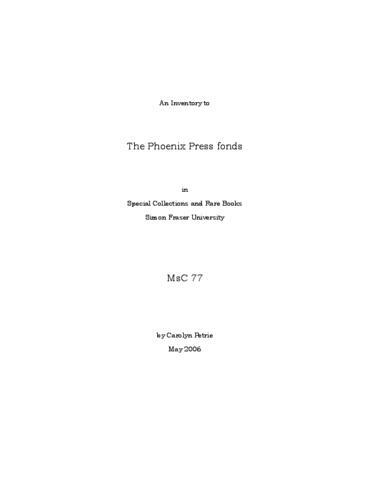 Phoenix Press was a publishing company started by Alfred W. Purdy and B. Alexander Widen. The Press only published one book, Cougar Hunter: A Memoir of Roderick Haig Brown by Al Purdy, in an extremely limited run as a result of a dispute between Purdy and Widen. Fonds consists of records relating to the business of Phoenix Press, and the publication of Cougar Hunter: A Memoir of Roderick Haig Brown. Records include a business agreement, correspondence, design and production files, printer proofs with edits and comments, promotional and sales records, cover artwork, and finished book.